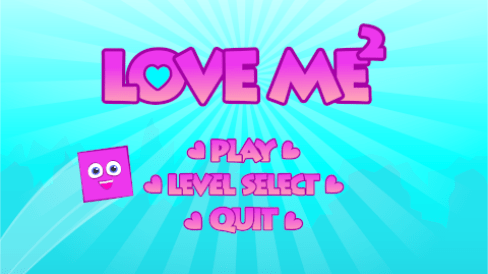 Love Me2 is a puzzle platformer with a focus on spreading love and happiness. The player takes control over cubes on each level and the goal is simple: Reach the door. The cubes come in different shapes which also manipulates their abilities, such as jumping and carrying other cubes on top of them. A cube can either be Neutral (the controllable purple cube in the above animation), Sleeping (the frozen blue cube in the same animation), or Depressed (not in the above animation). A depressed cube needs binary love to become happy and, in the sense of the game world, controllable. This is the basic concept of Love Me2 and my contributions to the project, which is currently upheld by myself and Charlie Raud (@raud_charlie), have been those of scripting and also a bit of designing. I have scripted the camera, the parallax effect, the cube state-machine and the input-/level-/menu- managers so far. The project is still in its earliest form. There is a short animated intro for the game available here on YouTube!